It may seem like your body is not doing much while it’s sleeping, but it is still burning calories. Normal life functions, like breathing, expend energy enough to burn calories, although the calorie count during sleep is very low. While a low calorie count is not surprising, what may be surprising is the body burns nearly as many calories while sleeping as it does while you are sitting around watching TV. As you likely expect, the number of calories you burn while sleeping is low, with the exact amount depending on your weight. If you weigh 160 pounds, you burn 69 calories per hour while sleeping, the FitWatch website calculates, which adds up to 552 calories burned during eight hours of sleep. A 120-pound person burns 51 calories per hour sleeping, or 408 for eight hours; a 200-pound person burns 86 calories per hour, or 688 for eight hours of sleep. Sleeping is at the very low end of the scale compared to calories burned performing other activities. Compare the 160-pound person’s 69 calories burned each hour during sleep with the 183 calories that person would burn walking at 2 mph for an hour. One hour of bowling burns 219 calories, one hour of swimming laps burns 511 and one hour of running at 8 mph burns 986. Sitting around watching TV burns about 70 calories per hour for a 154-pound person, the Diet Health Club website calculates. You’ll burn more calories -- several extra hundred each night -- while you sleep if you keep your body temperature cooler, the Women Fitness website advises. When you bundle up in heavy blankets and wear thick pajamas, your body does not have to work to supply natural body heat. Sleeping with a cooler body temperature, sans excess blankets and cozy pajamas, makes your body’s thermostat work to provide natural body heat. Substituting exercise for sleep time sounds like it would be an ideal way to lose weight, but it’s actually not. Not getting at least seven hours of sleep each night can pack on the pounds. 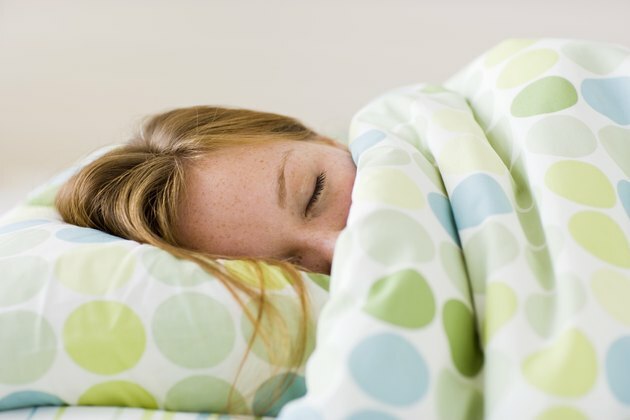 When your body gets fewer than seven hours of sleep, hormones that increase your appetite kick into high gear. This will likely make you eat more than you would if well-rested. In addition to being hungry, your body will also crave carbohydrates and other high-calorie foodstuffs. Eating when your body thinks it’s time to be sleeping is another way to gain weight, because the hours at which you eat play a part in weight gain, a 2009 Northwestern University study of obesity concluded. Professor Fred Turek and colleagues examined two groups of mice. One group ate high-fat food during their normal wakeful hours and the other ate the same high-fat food during their normal sleeping hours. Those that ate during their normal sleeping time gained 48 percent more weight than those that ate when they would normally be awake. The study reasoned that the body’s circadian, or biological, rhythms burn more calories during normal waking hours.